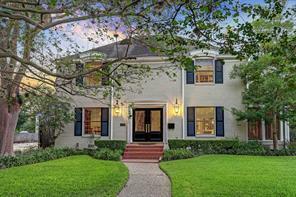 Historic Museum District home designed by renowned architect Birdsall Briscoe situated on nearly an acre. Sited under canopies of oak trees, the two story red brick estate with manicured gardens and swimming pool is distinguished by its geometric composition and elegant detail. Signature mill work throughout, the main house features ample entertainment spaces, sun room, library, breakfast room, well appointed kitchen, dumbwaiter, and two story family room. Wine cellar, laundry and utility below. Upstairs, all bedrooms have en-suite baths. The master encompasses a sun filled sitting room and dressing room. The detached garage affords a second story two room apartment with kitchenette and full bath as well as a greenhouse. The home is equipped with a 48KW natural gas generator. The current owners have maintained, renovated, and updated this home in the nearly four decades of stewardship. Stately Southampton 5-bedroom custom home. Great curb appeal with beautiful finishes. Gracious foyer leads to open floor plan, perfect for entertaining. Elegant dining room. The 14x14 study offers wood beams and custom cabinetry. Other features include impressive island kitchen, Subzero and Thermador appliances, wet bar, wine room, living room with gorgeous brick accent wall. Spacious Master suite boasts duel vanities, soaking tub, shower and large closet. Generously sized secondary bedrooms. Screened in summer kitchen, cocktail pool, lush landscaping accented by a fountain. 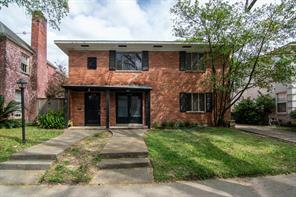 Great location, walking distance to Rice University and The Village. Stunning home on a beautiful tree lined boulevard in Southampton. Remodeled keeping every minute detail in mind. Some of the extra features include elevator to all 3 floors, kitchen with 2 dishwashers & 2 sinks. washer/dryer on 1st & 2nd floors, and U.V. Art Film on all windows. Home is meticulously maintained with plenty of storage space including two closets in the formal dining room. 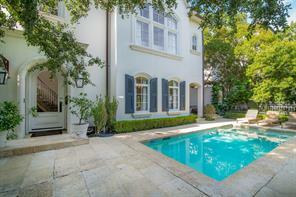 Large backyard with room for a pool as well additional private courtyard space off the master retreat. Floor plan could easily accomodate multigenerational family. Charming bungalow in Southampton. Updated kitchen with subway tile backsplash, butcher block countertops, SS gas cooktop and large pantry area with additional countertop space. Spacious living room. Master down with huge walk in closet and double doors leading to patio. Two upstairs secondary bedrooms. Additional bedroom downstairs could be used as study or possible 4th bedroom. Hardwood floors throughout. Generously sized backyard with mature fruit trees. Great location within walking distance to Rice Village! 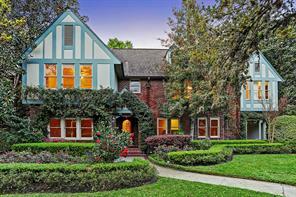 Glorious Birdsall Briscoe 1922 masterpiece nestled on .83 acre in prestigious gated Shadyside. Imposing yet gracious, it is engulfed in architectural purity as it blends grandeur and inspiration at every turn. Breathtaking entrance hall and stair hall interlace living room, dining room, library, bar, & vestibule, all immersed in Briscoe quality and style. There are 5 bedrooms, 5 baths +powder room. Sun-lit family room anchored by secondary staircase, opens to kitchen. 1st floor master retreat boasts large sitting room, luxurious bath & private veranda. English library landing unites 4bedrooms w/lavish ensuite baths. 3rd floor perfect for hobby room. Elaborate millwork & timeless elegance continue in the separate Writer’s Cottage replete w/marble entry, winding staircase, living room, reading room, study, bedroom, 2 baths, and kitchen. 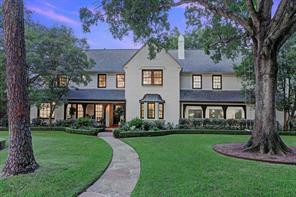 Stately grounds and brilliant architecture impart that this is a rare opportunity to own one of Houston’s finest homes. Porte-cochere, 5 car garage. 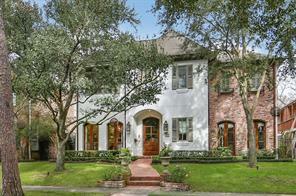 1324 South Boulevard - A John F. Staub designed Circa 1926 4 bedroom 3.5 bath 7,095 square foot English Country Home on a 37,260 square foot lot in the Historic - Exclusive Broadacres Neighborhood. Updated Kitchen - Butlers Pantry - Original Wide Plank Oak Flooring - High Ceilings - Perfectly Placed Windows - Grand Formals - Intimate Morning Room + Study. Large One bedroom apartment above the over sized detached garage. 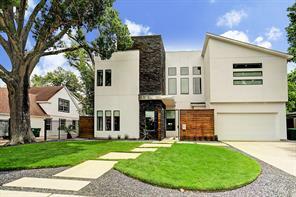 A masterpiece presented by Mesken Properties and Randall Davis Company, one block up from North Blvd. modern design with clean lines and lots of windows and light. Custom marble flooring in the living and dining to the completely isolated first-floor master suite wing, every detail has been carefully planned and meticulously placed to suit this luxury home. 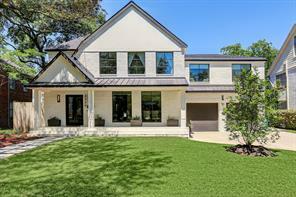 Thoughtfully designed 5 bedroom, 6 full and 2 half bath home features marble floors, 7-inch plank White Oak flooring, spacious open floor plan, LED lighting details, walnut built ins, and a wet bar with a climate-controlled wine room. Second floor includes 576 sf game room and 4-bedroom suites. Kitchen includes a Gaggenau appliances with Italian Design Pedini Cabinets. The custom Italian designed Walnut kitchen island is one of the two expansive kitchen islands. The extensively landscaped backyard is made complete with an outdoor kitchen, 570sf deck, 40x14 pool, and a three car garage. Living at its finest! Impeccable 6 bedroom, 7 full/2 half bath Custom Arriaga Smart home in Southampton. Grand entrance invites you into this impressive, thoughtfully designed home featuring travertine stone, wood flooring, dark wood accents, beamed and coffered ceilings, 3 staircases and a sophisticated elevator system. Spacious Gourmet kitchen with Viking appliances and water filtration system. Extra kitchen has separate exhaust system. Two Master Bedrooms, both with his and her closets. All bedrooms have en suite baths. Spacious den has soaring ceilings with expansive French doors and oversized windows welcoming views to a tranquil garden and sparkling water fountains enhancing the mosaic lined heated/lighted pool and jacuzzi. State of the art home operated by 2 wall installed touch screens controlling all lights and surround sound. Taking Mancave to the next level, 3rd floor is a suite with its own bedroom, walk-in closet, full bath and living room with a bar and fridge. This is the first time a PH in this building is being offered to the public- don't miss out on the opportunity to make this exquisite residence your home! 21' ceiling heights, double height window wall systems, Gaggenau appliances, Eggersman cabinetry are just a few of the features that this residence will offer. 24 hr. concierge! 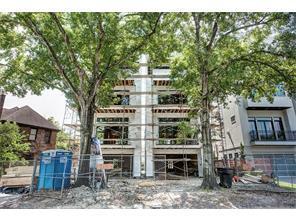 Lowest monthly dues of any new construction luxury condo! Walkability score of 82. Please contact me for a private viewing and details. ON-SITE SALES OFFICE NOW OPEN! CONSTRUCTION IN PROGRESS! Move-In 2018! This is the first time a PH in this building is being offered to the public- don't miss out on the opportunity to make this exquisite residence your home! 21' ceiling heights, double height window wall systems, Gaggenau appliances, Eggersman cabinetry are just a few of the features that this residence will offer. Lowest monthly dues of any new construction luxury condo! Walkability score of 82. Please contact me for a private viewing and details. 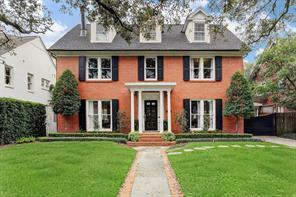 Stately Home With Pool on a 1/2 acre with Original hardwood floors. In A Historic Area of Houston. Walk to Rice University, Rice Stadium, Village shopping area. 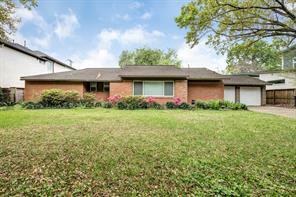 Very near Renowned Houston Medical Center, Historic Herman park, World Famous Houston Museum District. The master is private with walk in closet and sitting area, large bathroom. Amazing design with tall ceilings and many windows. The first floor is light and bright. Lush landscaping. NO Flooding BACK ON THE MARKET. Georgian estate by architect J.W. 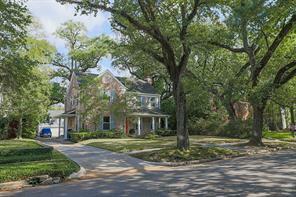 Northrup, Jr. on almost 1/2 acre in sought-after neighborhood where Majestic Oaks line the boulevard. Upon entering the home you step back in time to the ambiance of the 1920's with the graceful floorplan designed with wrap-around staircase, inviting foyer, spacious formal rooms & library. The home beckons you with a renovated chef's kitchen offering Carrera marble counters, top SS appl, & an abundance of cabinets. 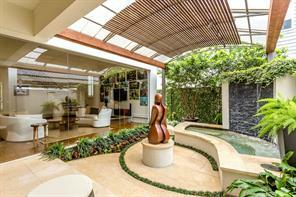 Entertain on a grand scale in the Garden Room/Den across the back with walls of glass & French doors that open to the expansive lawn & gardens. Travel up the staircase to the Master's retreat with sumptuous master bath & light-filled sitting room overlooking the grounds. Three additional en-suite bedrms plus a bonus room complete the 2nd floor. Unfinished 3rd fl offers endless possibilities for expansion. Original architectural details, plaster walls, high ceilings, & basement. 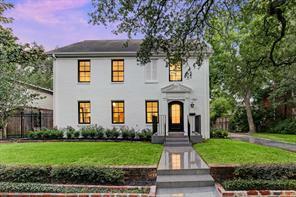 This Boulevard Oaks Beauty offers historic splendor at its best! 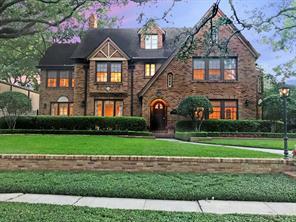 This classic Tudor 1923 home beautifully expanded and restored since 2001 captivates you from the moment you drive up. Close to 5000sf per builder plans, it has unique original design of two pairs of sunrooms on both sides serving as study, card room, sunroom and den. Gated drive off Institute to parking court, new three car garage with guest quarters, jetted spa, fountain and huge landscaped backyard. Five bedrooms, two studies, gameroom, two balconies, four full baths & formal powder coupled with terrific storage belies its era. Dramatic living area is 30 feet long with back to back fireplaces to Den. 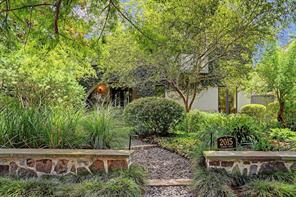 Incredible sense of light to beautiful outdoor areas including flagstone patio, and large yard space. There's even a basement housing one of four HVAC systems and boasts space for wine storage. 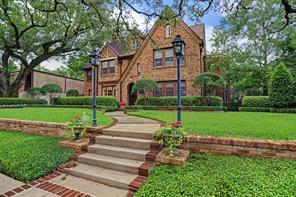 Blocks to the Museums, Rice, and minutes to Texas Medical Center, Greenway, and Downtown. Premium location on a prestigious street! Appointed with the finest of materials, this amazing, custom home was constructed in 2013 and offers an array of amenities. Measuring 5,751 square feet, the Spanish-style estate features a kitchen and family room with ceiling heights reaching 16' that overlook the enormous yard of this 12,000 square foot property. Located on the upper floors are four bedrooms with en suite baths, a generously proportioned study as well as a fifth bedroom that could be utilized for private sleeping quarters, workout room or master's retreat. The elevator-capable home has multiple terrace decks and covered porches to enjoy the grounds. Not to be overlooked is the 3-car garage with large workshop that is adjacent to the rear casita and bathroom facilities. The workshop could easily be converted to a sixth bedroom on the property. 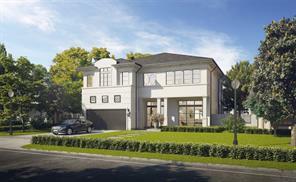 This Southgate jewel surpasses all expectations of what home customization truly means. From the commercial steel structure and framing to the metal stud walls. This luxurious piece of art is being designed to meet your every need. Additions such as a library/game room, gunite pool, the surveillance system & the elevator capabilities make this home one of a kind! 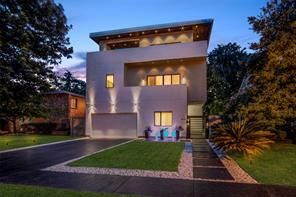 With effortless sophistication, this 3 story home is imbued with modern style & luxury comfort. Inside you’ll find a wonderment of amenities: floating stair case, a kitchen that boasts solid wood flooring, carrara marble countertops & premier appliances. The location speaks for itself! It’s surrounded by Roberts Elementary, Pershing Middle, and Lamar High School—all sought after schools in the area. Also, there is a plethora of venues that introduce Houston’s culture within close proximity. Being situated in the Rice/Museum district means easy access to Levy Park, The Menil Collection & TMC or I-610 for everyday commutes. Nestled in the charming neighborhood of Southgate, this 5 bedroom home was designed for both form and function as the first floor layout is capable of hosting formal dinners for numerous guests or allowing the entire family to casually lounge around and enjoy vistas of the lanai and expansive rear lawn. Exceptionally stylish renovation folded together the old and new in this classic, English Cotswold-inspired, Southampton home. The house and gardens were returned to life with Contemporary flair by Dillon Kyle Architects, UrbanCraft Builders, and Prewett Read & Associates Landscape Architects. The opened floorplan provides spacious, light-filled, seamlessly-integrated rooms with serene backdrops of the lawns, gardens, and Diana-style swimming pool. Appointments include commercial- grade metal and glass doors and casement windows; custom-stained oak floors; Donghia grass-cloth wall fabric; and designer tile and stone surfaces and floors. The professionally-equipped gathering kitchen/breakfast room opens to the great room where glass doors access the loggia and separate guest quarters. The expansive master suite offers a morning room or home office; custom-fitted walk-in closets; and a lavish, marble-clad. light-filled bathroom. Spacious secondary bedrooms have en suite bathrooms. The pinnacle of the Warwick Towers is Penthouse 30A. 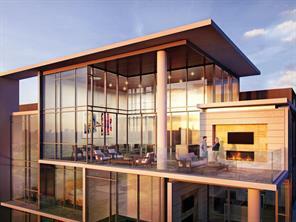 A spectacular 2-story residence offering grand reception spaces with unparalleled views of the surrounding skyline. Over 5,500 sq. ft. with multiple terraces awaiting customization. Double-door Entry. Banquet-sized Formals. Cozy Study/Den. Island Kitchen with Breakfast Room and adjoining Utility Room. Master Suite with sitting area, private balcony with Downtown view, and beautiful bath with oversized closet. Guest Suite down. A grand stairway ascends to an upper level flex space with sizable private terrace and bath (optional Bedroom #3). Additional building amenities include a 24-hour concierge, valet parking, manicured gardens, swimming pool/spa, and fitness center. 2 Reserved Parking Spaces. With an ideal location in the heart of Southgate, Smith Family Homes is collaborating with Masa Studio Architects to create an extraordinary home with finishes and a floor plan that are unparalleled. Situated on a 7,627 square foot lot, this 4 bedroom homes measures 5,180 square feet. The first floor was designed to have views of the yard that can easily accommodate a generously-sized pool. Oversized bedrooms, all with en suite baths, are located on the second floor and provide exceptional scale and functionality. 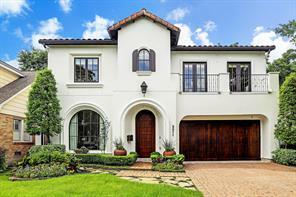 Dry in Harvey!Elegant Mediterranean,beautifully maintained recent construction located in one of Houston’s finest Neighborhoods,Old Braeswood.This gorgeous home is filled with amenities on almost 14,000 sq.ft. Lot Featuring mature trees,lush landscaping. Interior: 5” red oak hardwood & natural stone flooring, granite&marble surfaces, soaring ceilings.Spacious living areas include both formals,Butler’s pantry, impressive bar w/temperature controlled wine room.Chef’s kitchen,Thermador appliances,enormous island with beautiful single slab granite that is open to the sumptuous family rm.Richly appointed 1st floor master suite w/entrance to outdoor sunroom.Lavish spa inspired master bath w/colossal master closet. Impressive sunroom∑mer kitchen, massive fireplace and commercial grade accordion doors that open up to the harmonious spa pool with water&fire features.2nd floor w/four bedrooms all with private baths,well appointed game/media room and craft room.3 car garage, mud room and more! 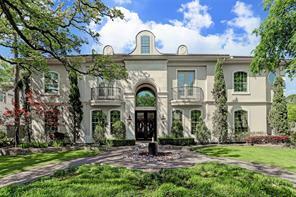 Another Stunning Residence from Houston's Premier Builder, Croix Custom Homes! This newly completed home artfully weds a mix of Traditional Architecture with meticulously selected "fresh modern" finishes to produce a Striking Transitional Home! Designed for both formal entertaining & easy family living, the first floor boasts wide plank white oaks floors, an impressive foyer with stunning staircase, paneled study with beamed ceiling, formal dining with barrel vault ceiling & climate controlled wine room. Large family room with beamed ceiling & wood burning fireplace open to the Chef's Kitchen with Wolf & Subzero Appliances and Large Breakfast Area. Wet-Bar, Butler's & Home Office. Large Master Suite with gas-log fireplace, beamed ceiling & luxurious marble bath. Upstairs Game Room with dry bar. All Bedrooms with en-suite Baths. Optional Quarters over Garage with driveway gate. Lanai with Gas-Log Fireplace & Outdoor Kitchen. Yard with room for a pool! Elevator Capable! Stunning! Modern sophistication and chic design illuminate this property in Southampton Place. Inspired by design, art and technology 2351 Dunstan is built for exceptional living offering upgraded features including Wolf/Gaggenau appliances, a 1500+ bottle temperature controlled wine room and a teppanyaki grill in the gourmet kitchen. 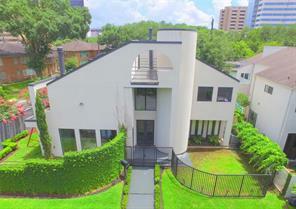 The spacious home showcases multi-levels, including a third-floor entertainers’ paradise which offers a bar, movie theater and a second kitchen which opens out onto the covered terrace with views of downtown and the Texas Medical Center. The ideal location of this smart home offers the finest in luxurious living with the ability to walk to neighboring trendy boutiques and restaurants and experience a one-stop destination in living from this incredible home. NEW PRICE!! 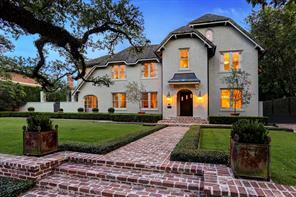 Beautiful 3-story home located in the Museum District features 4 bedrooms, 4.5 bathrooms, elevator to all floors, hardwood floors throughout, granite, marble, and hardwood counters, stainless steel appliances, exquisite light fixtures, grand door casings, coffered ceilings, and much more. The 3rd-floor living/media/game/flex room can serve as a "mother-in-law" suite as it also has a large bedroom and en-suite bathroom. The over-sized master bedroom has plantation shutters and two large walk-in closets with custom cabinetry. One of the secondary bedrooms has fantastic custom built-ins that can act as a home office or bedroom as it has a large closet and en-suite bathroom. All window treatments stay with the home. 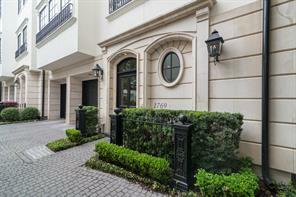 Conveniently located close to Rice University, the Museum District, Texas Medical Center, Rice Village, and NRG Park. No flooding during Harvey per sellers. This home is a MUST see! . Make your appointment to see this fabulous home today! 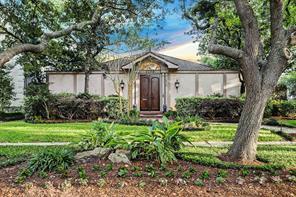 Sought after location within desirable Old Braeswood with no flooding. Quality construction on large lot built to maximize natural light, offer versatile floorplan & still have spacious outdoor spaces. One bedroom down perfect for visiting family. Master and four additional bedrooms up plus gameroom. First floor offers Gourmet Kitchen open to Great Room, Formal Dining Room, Formal Living/Study, large mud room, dedicated wine room, 2nd laundry room down. Have a soccer game in the backyard or relax by the summer kitchen in the side yard. Both back & side yard are large enough to accommodate a pool plus. 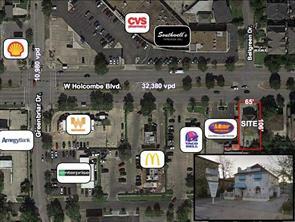 All these features & more in central location near Medical Center, downtown, lots of restaurants, etc. Custom residence for current owners who hired their own architect/builder for this elegant home. 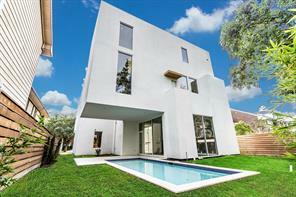 Situated in a small enclave of homes, close to Rice U and the Med. Center. Private location with an abundance of windows and natural light. Gracious sized rooms, large KT open to family/BRKFST room. Private study, 3rd fl with 1/2 BA. Slate roof, pool, synthetic grass lawns. Too many features to mention. 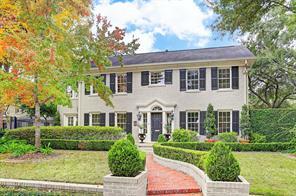 Elegant Georgian Southampton home with Landmark designation on 10,000+ sq ft lot. There are 4 bedrooms, one of which is down with en-suite bath, + 4 additional baths. Living spaces include: Living Room, Library, Sunroom and the Family Room opens onto Georgian portico with fountain. There is a large Dining Room for formal entertaining as well as a very spacious eat-in Kitchen with gas ILVE range & travertine mosaic backsplash. The kitchen overlooks the beautiful, inviting backyard. At the rear of the property is a large carriage house which includes a two-car carport w/an electric gate, laundry room w/bath & storage, all on the ground level, + a 39’ 3” x 14’ 2” apartment w/ceilings which vault to 11’9”. The apartment includes a kitchen, bath, ballet bar & mirror, all w/hardwood flooring in this light-filled flexible space which can be enjoyed in any number of ways. All rooms throughout this property have lots of natural light. First time on the market in 24 years. 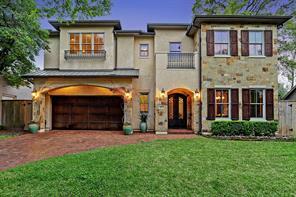 This architectural masterpiece features 4 beds / 4 full & 2 half baths. 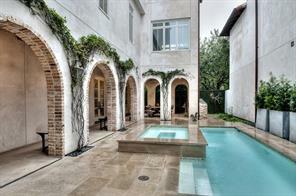 Enter thru secluded courtyard with pool & covered terraces. First floor den/bedroom with stone floors, sweeping circular staircase and elevator. Fantastic gourmet kitchen, huge breakfast with private covered terrace, multiple outdoor dining spaces overlooking the pool, outdoor kitchen, master suite with 2 closets and luxurious bath, game room and upstairs media room. Home also features Incredible views from fourth floor terrace. Tons of natural light and great art walls! 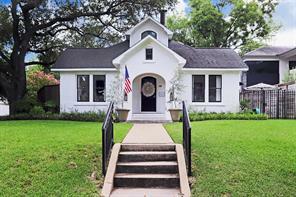 Located in the heart of Museum District and Hermann Park. 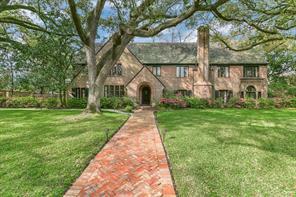 Picturesque English Manor in Old Braeswood. 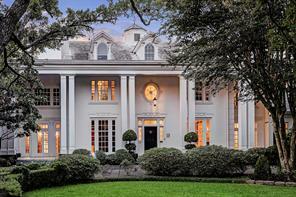 This historical residence ideally located on 22,700 Sq.Ft. 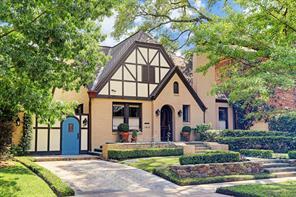 Exquisitely remodeled with attention to original architectural details. Graceful floor plan with inviting foyer, Chef’s dream kitchen with top of line appliances.Entertain on a grand scale in the vast den and impressive formal sitting room w/wood burning fireplace. As you walk up the stairway with original railing to the harmonious master’s retreat with expansive master bath & light filled dressing room. Three additional bedrooms and two full baths in addition to 1st floor full bath. Beautiful hardwoods throughout, glorious landscaped grounds with colossal trees & outdoor lighting, shower and hot tub. Lovely guest apartment with full bath and kitchen (528 sq.ft. per hcad) over original garage. No flooding! 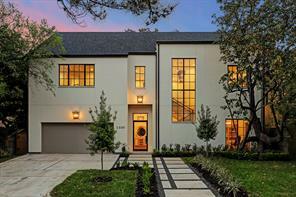 Smith Family Homes delivers a wonderful new construction located in the greater Southampton/Boulevard Oaks area, just blocks from Houston s world class museums. Sophistication and elegance balanced with an inviting warmth. Natural wood tones complement Calacatta gold marble featured in the kitchen and on the slab wrapped fireplace. Additional details; 12 ft. ceilings, wide plank oak flooring, chef s kitchen with Wolf - Sub Zero stainless steel appliances and two outdoor entertaining areas. Current sellers reconfigured and updated to create an exceptionally charming, functional and wonderful home located on one of the largest lots in Southgate. Enter thru gate on Goldsmith and encounter two outdoor park like yard areas with outdoor fireplace and patio. First floor - open kitchen/dining/entry/living area, separate den, gorgeous conservatory, full bedroom with bath, powder bath, additional room that could be a study or another bedroom that opens on to patio. Second floor includes master bedroom with vaulted ceiling, gorgeous master bath and large closet, two additional bedrooms with ensuite baths. This fabulous European style patio home w/tile roof by Southampton Homes is conveniently located in the Museum District. 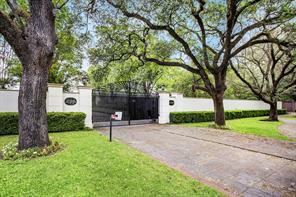 Iron entry gate leads to professionally landscaped European-style private courtyard. Kitchen and baths are stunning in Carrera marble.Perfect for entertaining with high ceilings,18th century fireplace mantel from France in living room/study,large light-filled dining room off the kitchen. First floor guest apartment and elevator to all 3 floors! ON-SITE SALES OFFICE NOW OPEN! CONSTRUCTION IN PROGRESS! Move-In 2018! Over 60% sold! Designed by internationally renowned architecture firm Perkins + Will, this expertly balanced, 20-home, lock & leave, true intimate scale-boutique style mid-rise combines its sleek steel & glass window wall system w/warm & distinguished hues. 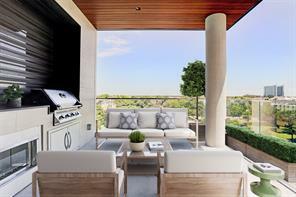 Over-sized terraces equipped with fire places and grills invite an indoor/outdoor flow for al fresco enjoyment. 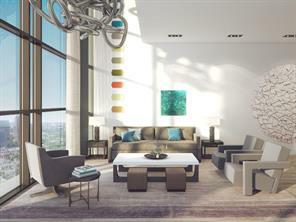 20' double-height windows in select residences permeate the interiors with an abundance of natural light. Lowest monthly dues of any new construction luxury condo! Walkability score of 82. 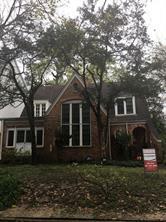 Beautiful Museum District home on 9,000 sq ft (HCAD) lot with loads of updates.Admire the soaring oak trees & esplanade on South Blvd from formal living & dining room.Home features 4 bedrooms 4.5 baths, chef’s kitchen open to Breakfast w/ Sub-Zero, Wolf appliances, marble island & counters.Wet bar/Butler’s pantry has wine fridge, dishwashing drawer, warming drawer & ice maker.Formal study features 3 walls of bookshelves w/ windows overlooking newly added pool and spa.Wine room located off study. 2nd floor has 2 en-suite secondary bedrooms, additional living space w/ wood-burning fireplace, sunroom w/ French doors that open to the balcony also accessed from Master BR.The spacious 3rd floor w/ full bath & built in's provides endless options as game room or studio.Separate pool house great for entertaining w/ 1st floor half bath, add’l utility & kitchen.Second floor guest suite has kitchen, bedroom & full bath.Custom drapery, woven shades & light fixtures throughout.All per seller. Glamorous executive home with 400+bottle wine vault, resort-style pool, and oversized elevator. 34' ft ceilings, three-story ascents of glass windows, dramatic open staircase, and massive gallery walls frame the entertaining areas, while elements of marble, glass, stone, fire and wood ground the home’s interior design. Double-island marble and granite Chef’s kitchen with Thermador appliances offers views over pool and waterfalls. Private Master Suite and living room shares view-through fireplace with glamorous marble bath. Three additional bedrooms w/ensuite baths; 3rd-Floor Flex room w/private bath. Outdoor entertaining areas: Alfresco kitchen, shaded lanai, outdoor living room, landscaped gardens, covered third-floor rooftop terrace w/ tree-top views of Boulevard Oaks. Please see "Documents" for detailed list of upgrades and finishes. Move-in ready in less than 30 days! This building is a curated collection of only 20 total residences so opportunities are limited. The Lily plan offers generously proportioned rooms that easily allow you to entertain in a refined and spacious residence. Spectacular double height window in dining room .Offering the highest standards of luxury living, these residences offer interior finishes such as Miele appliances (gas), Eggersman cabinetry, Cosentino countertops, museum finish walls, LED art lighting and much more. Over-sized terrace (13x14) with gas grill, heat circulating fireplace and prewired for TV! Model now available to view. Stunning Soft Contemporary Home completed by Croix Custom Homes in June of 2015. This home rivals new construction, is on an oversized lot with a Sparkling Pool and Spa. As you step inside the home, you will love the wonderful natural light, open floor plan with Wide-Plank Oak Floors throughout (except baths). 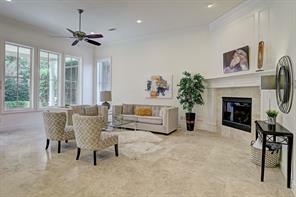 Family Room with a Fireplace Surrounded by Stacked Stone plus Built-In Cabinetry & Shelving. 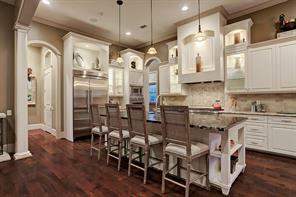 Island Kitchen with Shaker Style Cabinetry, Breakfast Bar Seating, Breakfast Area and Dry-Bar. Luxurious Master Retreat plus a "Spa Like" Bath and Two Incredible Closets. Study on the Second Floor, Game Room with a (19x16) Covered Roof-Top Terrace. Home Office on the First Floor, MUD Room, Custom Window Treatments and Elevator Capability. Covered Lanai, Summer Kitchen, Mature and Well Manicured Landscaping with Lighting. Beautiful Block with Lovely Mature Trees. 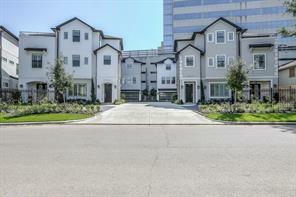 Close to the Med Center, Rice U, Downtown Houston and walking distance to the Rice Village! 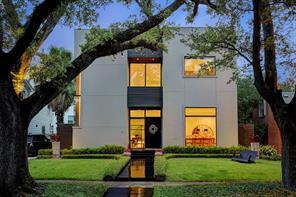 An exceptional Michael Landrum home. 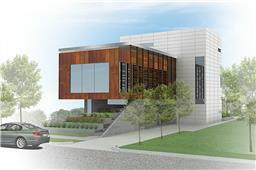 Thoughtfully designed to offer privacy, extensive wall space for art and abundant storage. Living areas with concrete floors, high ceilings and wonderful natural light. Solar shades and custom draperies. Gourmet kitchen with breakfast bar, eat-in breakfast room, viking 6 burner range, thermador refrigerator, two Bosch dishwashers and double Bosh ovens. Formal dining with butler's pantry and wet bar. Master suite with luxurious master bath, over sized closet and private terrace. Relaxing covered patio and pool. Another fine home built and designed by Hampton Lane builders. 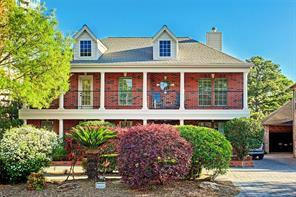 Ideal location, situated on highly sought after Vassar St. in Boulevard Oaks. 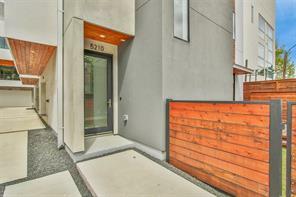 Quiet tree lined street, this stunning new construction structure is located on the preferred south side of the street. Country French inspired, this gorgeous home is to be completed mid August, per seller. Four bedrooms, each with their own bathroom. Huge master suite + enormous closet and inviting bathroom. The home is surrounded by a large courtyard and truly makes a statement, inside and out. Call for floor-plans and specifications. Nothing overlooked with this remarkable dwelling and grounds. Gas lanterns illuminate the exterior structure. The Mondrian is a sophisticated boutique building of only 20 residences on the Caroline Street esplanade in The Museum District. Unit 503, the 3 bedroom, 3.5 bath Victory plan, has a generous layout offering beautifully proportioned rooms and wonderful space for entertaining. The unit is distinguished by a 21’ double height window in the breakfast area with framed views. The large corner terrace overlooking the Asia Society has both a gas fireplace and gas grill and is pre-wired for a television over the fireplace. The kitchen is highlighted by Miele appliances including a gas cooktop, custom Eggersmann cabinetry, and Cosentina countertops. Free standing soaking tub and walk-in shower in the master bath. Other features include museum finish walls, LED art lighting, wide plank hardwood floors, and 10’ ceilings. 24 hour concierge. Additional storage unit currently available for purchase. 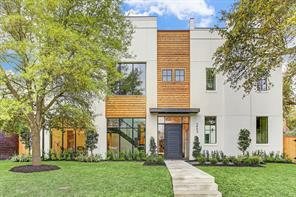 This is an exceptional opportunity for a modern lifestyle in Houston’s most dynamic area. 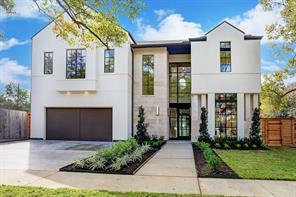 Gorgeous Georgian Style home utilizes architectural sophistication and custom design. Floor plan smoothly transitions from one area to the next with entertaining in mind. Welcoming arched door leads into a high barrel vaulted foyer. Gleaming solid Oak flooring continues throughout. Recently installed Pella windows. Custom Artistic lighting has been added to display treasured art. Split Formal Dining and Library. Step down into the Living area complimented w/high ceilings & a wall of 3/4" commercial glass windows overlooking a stunning covered courtyard. Private low maintenance courtyard features a 9 person spa, stone wall waterfall/mosquito system & Builtin 36" Grill. Island kitchen features Stainless Steel appliances/viking cooktop/granite counters/butlers pantry/Wet Bar w/wine fridge/wine storage/sink. Romantic Master Bedroom leads into a Updated Spa-like Master Bath. Relax in the claw foot tub. Secondary Bdrms have updated ensuites. Convenient Programmable Lighting. Porte-cochere. 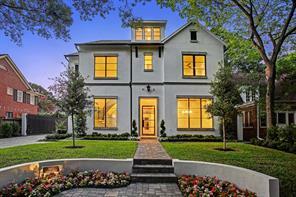 Another Stunning Residence from Houston's Premier Builder, Croix Custom Homes! 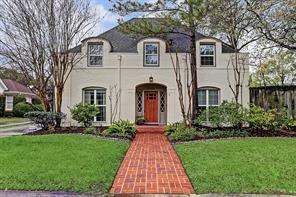 Fabulous French Contemporary, with fine finishes! 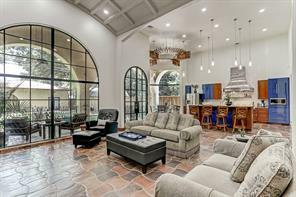 Wonderful Open Floor plan with Both Formals & Impressive Study. Family Room open to the Island kitchen with Breakfast Area & Wet-Bar. Upstairs Game Room and all Bedrooms on the Second Floor. Elevator Capability! Back yard with room for a Pool, Detached Two Car Garage. Wonderful location with Beautiful Mature Trees. Enjoy a resort-like lifestyle while only minutes away from the Medical Center, Rice Village, Hermann Park and the museums. 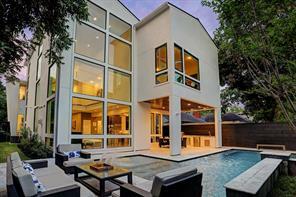 This contemporary masterpiece boasts open living spaces with fabulous views to the lushly landscaped grounds and pool. 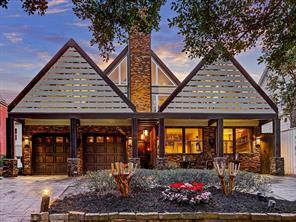 Summer kitchen, fire and water features, and an incredible fully lit tennis court. Master bedroom down with loft and door leading to back yard oasis. Downstairs media room and pool table. Three beds with full baths upstairs. Separate entrance to guest suite, complete with sauna and steam shower. Eat-in kitchen with top of the line appliances. Mud/utility room, just off the 3 car garage. There is a private well on the property that supplies all the water for the irrigation system. This makes a huge difference in your monthly water bills! Traditional meets Transitional in this New Construction Home by Croix Custom Homes. Timeless and Elegant Exterior Elevation, with Sophisticated finishes throughout the interior! Both Formals, Family, Wet-Bar and Kitchen/Breakfast Area are open with Great Flow for Entertaining. Large Master Suite with Two Large Walk-Ins Closets and a "Spa" Like Bath. Study on the Second Floor, Huge Game Room with are Full Bar and Seating. There is also a Billiard Room for those like to shoot pool plus Cigar Balcony, this is the Ultimate "Man Cave"!! Covered Lanai with a Summer Kitchen, Mud Room, Elevator Capable, Room for a Pool, Wonderful Street with Beautiful Trees. Several Entertaining Spaces make this plan both flexible and appealing! Move-in ready in less than 30 days! This building is a curated collection of only 20 total residences so opportunities are limited. The Alberi plan offers generously proportioned rooms that easily allow you to entertain in a refined and spacious residence. Spectacular double height window system in living and dining room. Polished interior finishes include Miele appliances (gas), Eggersman cabinetry, Cosentino countertops, museum finish walls, LED art lighting and much more. Model now available to view. JUST COMPLETED New Construction by Croix Custom Homes. 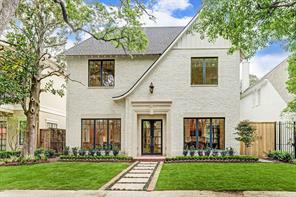 This Stunning Transitional English Residence, offers Distinctive Architectural Elements, with fine clean finishes! 11Ft. Ceilings on the 1st Floor, 10 Ft. on the Second, Both Formal Living Room and Dining Room, Kitchen with a Large Island open to Breakfast Area & Large Family Room. Fantastic Wet-Bar with Wine Refrigerator, Ice Maker, Wine Storage and More.. Boxed Beamed Ceilings, Wide Plank Oak Floors, Solid Iron Railing and Incredible Tile Work Throughout the Home! 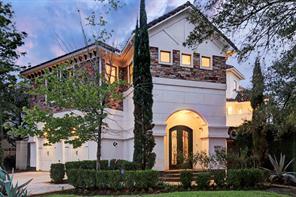 Outstanding Master Retreat with a "Spa Like" Bathroom and Incredible Closets. Study on the Second Floor, Game Room with a ( 19 x 17 ) Covered Porch, Epoxy Treated Garage Floor, Mud Room, Elevator Capable! Covered Lanai, Summer Kitchen, Room for a Pool! DID NOT FLOOD DURING HARVEY! Beautiful Block with Lovely Mature Trees. Absolutely Gorgeous, so don't miss viewing this home. 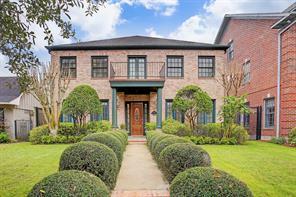 Your opportunity to own this historic gem in a gated enclave in the heart of the Museum District and in the shadow of the Medical Center.The updated interior abounds with natural light. Enjoy the sculptured rose garden from the comfort of the capacious covered patio. 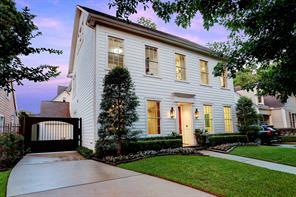 Complete with additional quarters with private gated access.A City of Houston Landmark listed in the National Register of Historic Place by the United States Department of the Interior. Please take the virtual tour and also experience our drone aerial photos. just click on the film reel icon above. 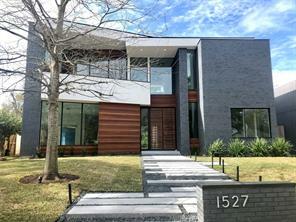 Just Completed, Contemporary/Modern Masterpiece by Houston's Premier Home Builder, Croix Custom Homes! This Stunning and Sleek Home Features 11ft Ceilings Down, 10Ft Ceilings Up, Dramatic Two-Story Dining Area with Soaring Ceiling, Interior Glass Railing, Large Open Family Room, Chef's Kitchen plus a Fantastic "Floating" Wet-Bar to Service both Formal and Informal Areas. First Floor Study/Library, Upstairs Media/Game Room. Ultra High-End Finishes! Elevator Capable, Epoxy Treated Garage Floor, Covered Lanai and Yard with room for a Pool! Stunning! In 2016, the heralded team of David James Custom Homes and Brickmoon Design collaborated together to construct this flawless 4,079 square foot home. Nestled in the north section of the charming Southgate neighborhood, this four bedroom home offers the finest of finishes with a superb floor plan. Boasting a bedroom on the first floor, perfect for visiting guests, the living, kitchen and dining area provides an open and inviting layout. The second floor has the master suite, two additional bedrooms, as well as a flex room, which is currently utilized as a library. 2135 Dryden is the ideal solution for those that desire the high end finishes offered with new construction while having a home that was suitably designed in scale and proportion. Move-in ready in less than 30 days! 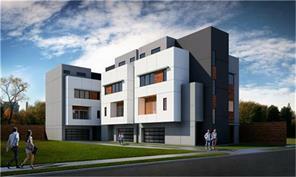 This building is a curated collection of only 20 total residences so opportunities are limited. The Tableau plan offers generously proportioned rooms that easily allow you to entertain in a refined and spacious residence.Offering the highest standards of luxury living, these residences offer interior finishes such as Miele appliances (gas), Eggersman cabinetry, Cosentino countertops, museum finish walls, LED art lighting and much more. Over-sized terrace (13x14) with gas grill, heat circulating fireplace and prewired for TV! Model now available to view. NEVER FLOODED! 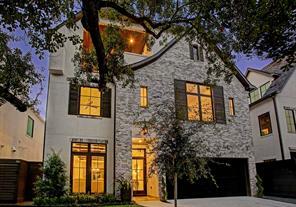 This stunning Boulevard Oaks home, built by award winning Covington Homes is one of a kind. Neither cookie cutter nor stark modern, this Northern Italian inspired home is inviting, cozy and a timeless classic. Luxurious features include antique brick accent walls, dining ceiling and stair treds, hand hammered copper farmhouse sinks in kitchen/ bar area, tumbled travertine floors, handscraped hardwood floors, imported marble, barrel glass mosaic ceiling in master, cast iron balustrades and custom Wright iron doors. Thermador appliances compliment an incredible kitchen. Four bedrooms and huge gameroom up. Optional 5th bed with full bath down. Summer kitchen, covered patio and spacious yard large enough for a pool. 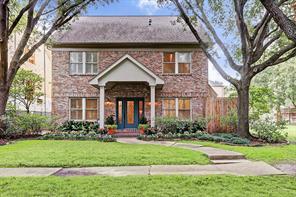 All with easy access to 59, 610, Rice Village, Downtown, Texas Medical Center and The Galleria Walk to acclaimed Poe Elementary. Buy now ahead of Med Center expansion and rising interest rates! 1715 Sunset is a front unit in the beautiful Cheyne Walk community convenient to area parks, museums and close to the Medical Center. Easy access for homeowners, guests and deliveries with the front door facing tree lined Sunset Boulevard. Tastefully appointed throughout. The formal entry has pool, fountain and patio views. 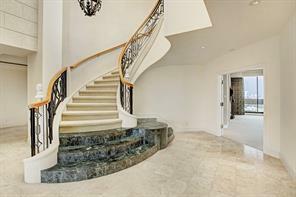 A winding stair and private elevator takes you to all levels of the home. Bedroom and bath on level one. Second level living. Island kitchen with stainless appliances opens to a family room with a fireplace, built-ins and Sonos Sound. Breakfast room has access to a balcony with a stainless grill and pool views. Butler’s Pantry leads to the dining room. Large formal living room with 11 foot ceilings and a fireplace. Walnut floors. Master bedroom suite has a sitting room with fireplace, a well-appointed master bath and an awesome walk in closet! Study with tree views, utility room and another bedroom and bath also located on the third level. A fine home. 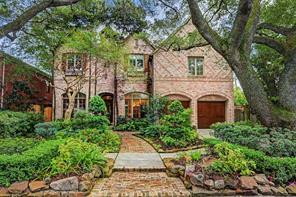 Captivating Tuscan Villa in desirable Museum/Rice University area on North Boulevard. Quality craftsmanship is evident throughout this meticulously cared for home. Features include antique brick interior accents, groin ceiling in the dining room, wine alcove, downstairs guest suite which could also be used as a study, and iron & glass exterior doors. The great room is open to the gourmet kitchen with custom, stained cabinetry, center Island, a huge walk-in pantry, and wet bar which opens to the foyer for entertaining ease. Travel upstairs to a Media/Game Room with a wall of built-ins, three secondary bedrooms, and a fabulous Master Suite with dual walk-in closets & spa-like bath. 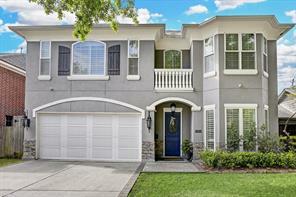 You will enjoy the covered patio and built-in grill overlooking a beautifully landscaped yard. Wow! 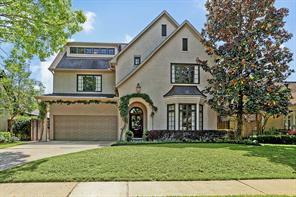 Amazing custom home located in the desirable Southampton neighborhood. Just minutes from Downtown, Medical Center, Museum District and walking distance to the Rice Village, acclaimed restaurants & fabulous shopping. Spacious family room, dining room & game or media room. This home has a great floorplan for entertaining. 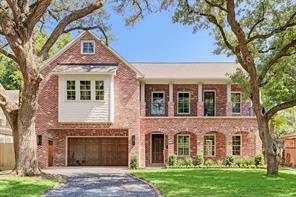 Gorgeous hardwood floors, custom fixtures, fireplace, central vac system & wine fridge. Surround sound in most rooms. Fabulous gourmet kitchen w/ striking granite countertops, stainless commercial grade Viking cooktop, Sub Zero refrigerator, Thermador dishwasher, contemporary glass tile backsplash, custom cabinets and a wine cooler. Luxurious master bedroom and sitting area. Master bath offers large tub, separate shower, dual sinks & a large closet w/extensive build in's. 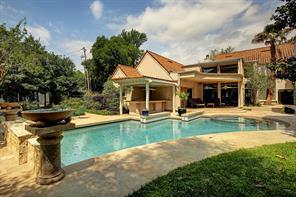 Fabulous outdoor living area featuring covered patio and wonderful views of the backyard, pool and hot. This home is truly a jewel! 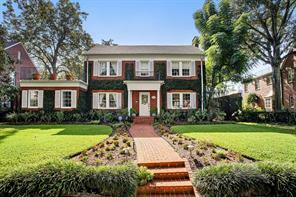 This Classic 2012 brick home rivals new construction w/ an incredible open floor plan in the heart of Southgate! This home offers a gentleman's study w/ the dining room open to the large living room w/ gorgeous hardwood floors. A true cook’s kitchen w/ oversized island, double ovens, farm sink and large built-in refrigerator opens to the living room and breakfast room which has full views of this gorgeous backyard. The large master retreat w/ tray ceiling and a spa-like master bathroom plus double walk-in closets offers a relaxing space after a long day. Four spacious bedrooms up w/ 3 full baths plus a fabulous game room w/ wet bar. High ceilings allow tons of natural light into this inviting home! Backyard is beautifully landscaped w/ synthetic turf (perfect for children and pets!) plus a covered brick patio w/ outdoor kitchen and fireplace. 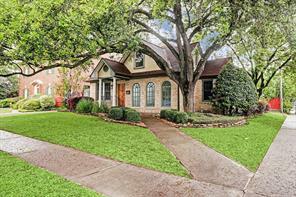 Close to Rice Village, Rice University, Medical Center, Downtown and Roberts Elementary. Please verify all info - all info per seller. 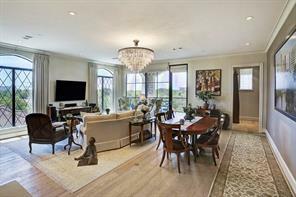 Elegant townhome in the heart of Southampton within the cozy lock and leave community of Cheyne Walk. This French contemporary features light and bright living spaces throughout, as well as views of the tree line and cityscape. The first floor includes a welcoming entry and spacious en-suite bedroom. Upstairs is the open concept living & dining, with spacious chef’s kitchen featuring SubZero, Thermador & Wolf appliances, ample storage with custom cabinets & a breakfast nook. On the third floor, the master suite is generously sized with a spa-like marble master bath including classic soaking tub & glass encased shower, as well as a cozy study & utility. Take the elevator up to the game room and a sun-drenched en-suite secondary bedroom. 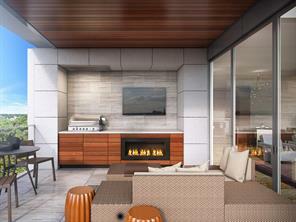 Open the French doors off the game room to enjoy city views from the large terrace with summer kitchen. 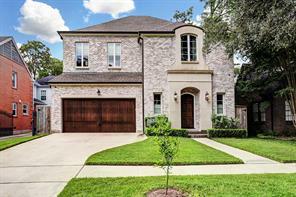 Close to retail, the Medical Center, Rice University & the Village, you'll love this walkable location and lock & leave lifestyle. 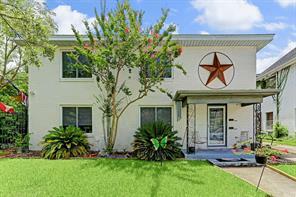 Back on the market, drastic price reduction, motivated sellers, priced to sell. Stunning fifth floor unit on Sunset Boulevard with dramatic skyline views of the Medical Center, Galleria or Downtown from every window. Impressive attention to detail throughout, fabulous gourmet kitchen with center island, open living-dining great room with bonus breakfast area and bar. Two prime side by side parking spots, plus one large storage unit. Controlled access, 6 story mid rise with 10 units , 2 per floor, semi-private elevator access, ground level garage, guest parking at rear of building with back entrance into garage. Chateau Ten Sunset's framing is structural steel and metal studs per builder. 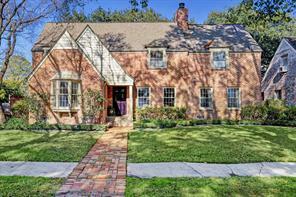 Located close to Rice University, Medical Center, Rice Village, parks, museums, restaurants, and shopping. 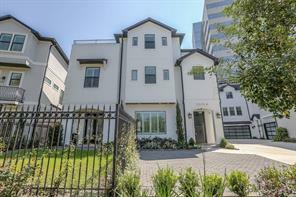 Your opportunity to inhabit the most unique lock-and-leave enclave in the Rice/Museum District area. 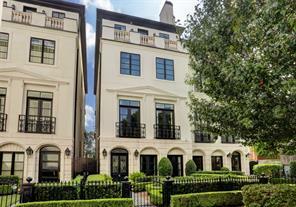 This home in Cheyne Walk, the inspired community of English-style townhomes by esteemed Rohe & Wright, offers a versatile, livable floor plan trimmed in the exquisite finishes that are the builder’s signature, all clad in a calm, light palette. Custom touches by the owner include closets added to game room for easy conversion to 4th bedroom, and most notably the Tom Wilson-designed soft contemporary kitchen with Viking, Sub-Zero, and Bosch appliances.Terrace looks eastward for a moonrise view while dining alfresco. 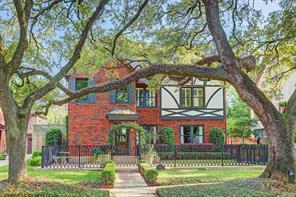 The lifestyle here blends Southampton elegance, Museum District vibrance, Rice Village walkability, and Med Center convenience in a picturesque, beautifully maintained, gated haven. 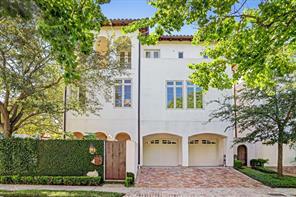 Exquisite Mediterranean villa with close proximity to Rice Village, Rice University, Texas Medical Center, museums, and art galleries. This home is beautifully designed for entertaining family and guests with its open concept layout on the first floor and all bedrooms on the top floor with a balcony overlooking the pool. 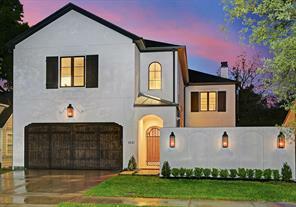 This gorgeous 4 bedroom/3.5 baths home also comes with a stunning LED lit cocktail pool, wet bar, 10’ stucco wall for privacy, outdoor kitchen, mosquito system, built-in speakers, art niches, security camera/monitoring, and many designer touches. The master bedroom suite includes his-and-hers 10’ ceiling closets, an ultra-spacious shoe closet, and luxurious bath with double rainheads and jetted tub. What a beautiful home! European style charming home located on a corner lot in Rice/Museum/Southampton area, a short walk to incredible dining & shopping. Lush private landscaping surrounds the swimming pool, hot tub & outdoor lounging areas. A grand spiral staircase ascends three floors. *Elevator Capable*. Unique living salons with soaring ceilings are located throughout the home that includes 3 bedrooms & 3.5 baths ##ONE BEDROOM PER FLOOR## for ultimate privacy. Hardwood & Travertine floors throughout. The open kitchen, located on the 2nd level has Viking and Sub-Zero appliances, a wine cooler & separate ice maker. The formal dining room features a barrel-vaulted brick ceiling. A custom stone fireplace graces a living area. The 3rd floor owner’s suite has exceptionally high ceilings with a bathroom that includes 2 vanities, a large soaking tub and a large walk-in steam shower. 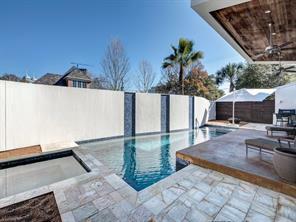 This is truly a private oasis that is perfect for entertaining & located in the heart of the city. 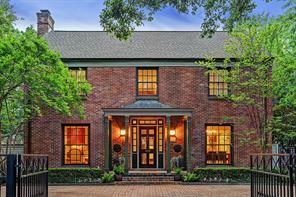 Just a few blocks from Rice Village and Rice University, this meticulously restored 1936 gem is waiting for its' new owners. 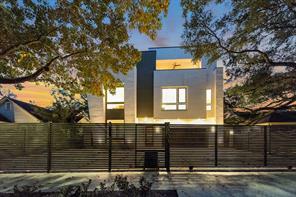 This exquisite home that sits on the tree-lined street of Banks offers more than words can describe. Fabulous layout with all the right spaces, including a separate spacious full living quarter above the garage that has a separate electrical meter and includes a full bathroom and bedroom! The beautiful main house offers 4 large bedrooms with soaring ceiling heights on the second floor, a wide open concept, hardwood floors, incredibly large living room and master bathroom, Carerra marble countertops, high-end Thermador appliances, and much more. Move in Ready! 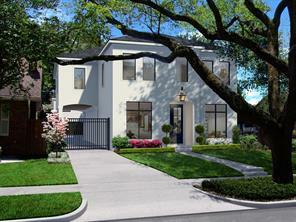 The Moderne Rice Village is an ultra-exclusive boutique condominium in one of Houston’s most desired neighborhoods. Located adjacent to the Southampton & Rice Village, The Moderne Rice Village provides unparallel privacy while providing residents with some of Houston’s best restaurants, boutiques and nightlife. The Moderne hosts a Walk Score of 92! 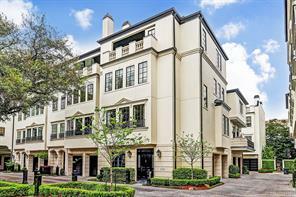 This boutique, mid-rise condominium is Houston's ONLY all penthouse building with 6 full floor of residences, private direct elevator access, open living space, sleek finishes & luxurious private master suite. 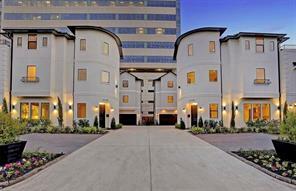 Enjoy panoramic views of Houston, two balconies, hardwood floors, and a lock & leave lifestyle. Exclusive private presentations with tours of views available. 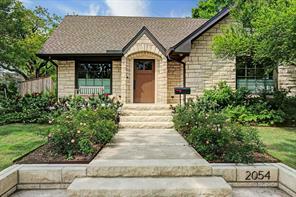 Open House Saturday & Sunday, 2-5PM. Welcome home to 2231 Tangley. This charming contemporary craftsman cottage was thoughtfully designed to fit sensitively into the historic feel of its bucolic Southampton neighborhood. 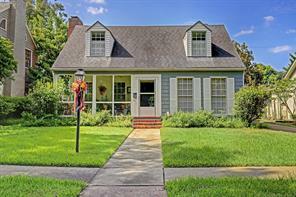 Located just blocks from Rice University, this home offers the look and feel of a 1930's cottage but with the amenities one appreciates in newer construction. You'll love saying "hey" to the neighbors from your front porch in the evenings. 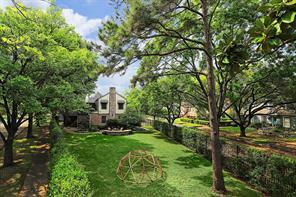 Or more intimate gatherings in your beautifully landscaped private yard. Great floorplan with one bedroom down with it's own access to the courtyard. Master suite is up with its oversized dual closets and cool black and white tile bathroom. Two more en-suite bedrooms up along with a second study which could be used as a 5th bedroom. Other features include: cook's kitchen with green slate counters and stainless appliances, High ceilings, open floor-plan, gleaming oak hardwoods, walk-in attic and abundant storage throughout. Oversized garage with alley access. 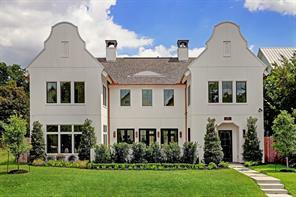 This stunning home has the level of detail, finishes and features usually reserved for a show home because it is the personal residence of one of Houston’s top interior designers. With four bedrooms, three-and-a-half baths, an upstairs sitting room or playroom, and a bonus third-floor flex / media room space, 2410 Southgate offers you both room to grow your family and room for a pool in the back. Situated on the premiere boulevard in the southwest slice of heaven known as Southgate, this home is minutes away from the strong job centers of Texas Medical Center, Rice University and Downtown and enjoys easy access to beloved parks (Hermann & Evelyn’s) and dining, shopping, and amenities of Rice Village, Upper Kirby, West University, and Bellaire. Savvy buyers and agents will recognise that to buy a year 2011 home of this size for under 1.3m is all but impossible in such a good location as Boulevard Oaks. If you've been looking all summer and waiting for the right home to fall into your budget, this is your opportunity. This luxury home is a timeless mix of traditional and contempoary. Family room, open plan kitchen and breakfast area, study and formal dining area define the first floor. Spacious Mud "closet". Sumptious master suite with personal office on the 2nd floor together with 3 other light and airy bedrooms. Hardwood flooring on floors 1 and 2. Elevator capable. Gameroom, guest suite or 5th bedroom on 3rd floor. Interior design by award winning architech and interior designers, Montgomery Roth. 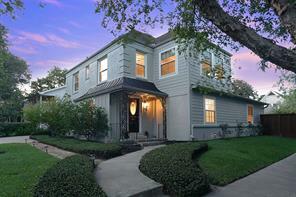 Walk to Rice Village, Museum District, highly rated local schools and the local parks. Downtown and the Texas Medical Center are minutes away. Easy access to 59, 610, The Galleria and Uptown. Per seller. 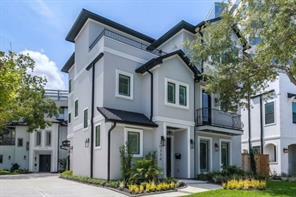 A Venice Custom Homes masterpiece! Contemporary Elegance with a well thought out and spacious layout. Grand entrance, first floor living and formal dining. A quintessential home for entertaining. Elevator access to all levels. Game room access to expansive third floor terrace. Thermador/ Wolf appliances. 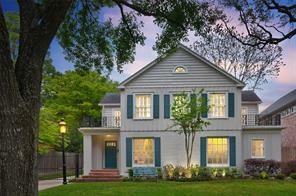 Exquisite light fixtures, gorgeous custom shutters and high quality finishes throughout. 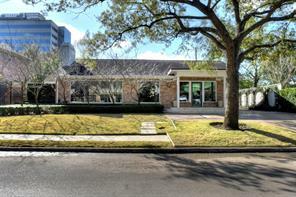 Conveniently located to the Medical Center, Rice University and Downtown Houston but tucked away for relaxation. Luxury living at its finest. This home has it all. 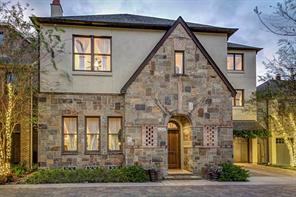 Elegance & good taste abound in this exquisitely designed home in desirable Southgate! The welcoming entry leads to the formal dining room and study for fine living or entertaining. 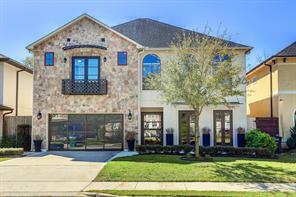 Gorgeous gourmet kitchen with Travertine tile floors, granite counter tops, built-in KitchenAid refrigerator, double ovens, ample cabinet & counter top space, walk-in pantry with extra cabinet space and a butler's pantry/dry bar with wine fridge. The gas log fireplace exudes warmth in the open plan family room. Upstairs is the spacious Master Suite with an oversized shower, dual shower heads, walk-in closet & freestanding bathtub. There are 3 secondary bedrooms and a large game room upstairs. 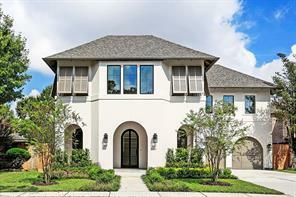 Other features include; plantation shutters, crown molding, porte cochere, sun screens, open floor plan, arched doorways, oversized garage, ample storage space & coffered ceilings. Enjoy the beautiful landscaping while relaxing on the covered back porch. 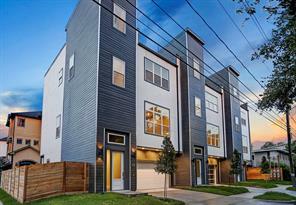 Walk to Rice Village, NRG, the Light Rail and more! Move-in ready in less than 30 days! This building is a curated collection of only 20 total residences so opportunities are limited. The Tableau plan offers generously proportioned rooms that easily allow you to entertain in a refined and spacious residence. Offering the highest standards of luxury living, these residences offer interior finishes such as Miele appliances (gas), Eggersman cabinetry, Cosentino countertops, museum finish walls, LED art lighting and much more. Over-sized terrace (13x14) with gas grill, heat circulating fireplace and prewired for TV! Model now available to view. 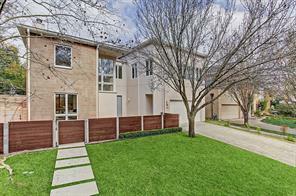 Wonderful opportunity to live in the heart of Southgate! Home sits on an oversized corner lot (9000 sq ft). Main house offers perfect opportunity to make your mark. Main house has 3 bedrooms up, 3.5 baths. Beautiful new limestone patio and sparkling pool. New full pool bath on ground level. Gorgeous garage apartment just completed in 2019, 2 bedroom/1 bath, approx. 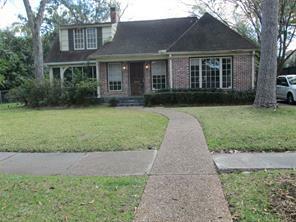 600 sq ft. Stones throw from Rice University running path, Rice Village and the Medical Center. 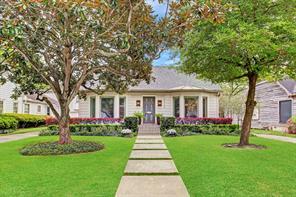 OPEN HOUSE SUNDAY, 4/14 FROM 1-3 P.M.
A 1930s home impeccably renovated, featuring designer details throughout, combines charm with modern elegance in the heart of Southgate, just steps away from Rice Village shopping, Rice University running path, and The Medical Center. The traditional character of the home coupled with its superior-quality upgrades make for a home that is both warm and inviting, tasteful and sophisticated. New chef's kitchen includes quartz counter and island, Thermador range and double Thermador ovens, warming drawer, Subzero refrigerator, Bosch dishwasher and plentiful storage. Kitchen flows seamlessly into dining room for easy entertaining. Light and bright, oversized windows abound. Upstairs bathrooms updated with marble counters. Master bathroom features marble counter, double sink vanity, frameless walk-in shower. Master bedroom boasts an enviable walk-in closet with storage island, ample built-in organization. Updated plumbing (2018), AC (2018), electrical with LED lighting (2018) and much more. Lovely 1928 traditional Southampton home thoughtfully updated with neutral palette. Downstairs master with wood floors and walk-in closet. 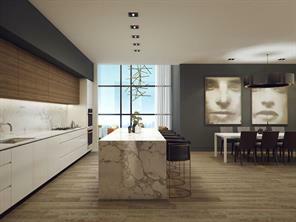 Kitchen has Sub-Zero, Bosch dishwasher, Gaggenau range with Pella windows throughout the home. Two generous size bedrooms upstairs with a jack and jill bathroom with a whirlpool shower/tub. Den with a wet bar upstairs. The home has an abundance of storage and built-ins, yet it feels warm and inviting. Stairwell to a floored attic that is approximately 33x13. Oversize garage along with a work area. Good walk-ability to the Village and Rice. Home owner is a licensed real estate agent. Buyer should verify dimensions. 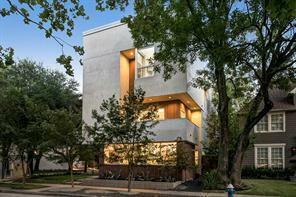 Stunning contemporary Museum District townhouse on a beautiful and quiet wooded street. The brick facade of this home is designed to offer complete privacy; yet, as you step inside this modern haven, you will be pleasantly surprised by the luminosity through the walls of glass and the spectacular views of the trees, the sky and the city! Incredible sensation of the outdoors being inside! From the walls of glass surrounding the pool and patio to the height of the ceilings, and the rooftop terrace overlooking the beautiful landscape of the city, this home exudes light and beauty! Please ask about our Matterport-Virtual visit of this beautiful home. 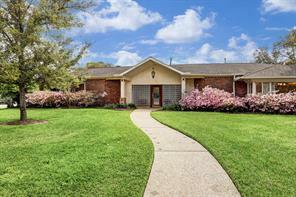 Wonderful home in Ranch Estates close to the Museums, Downtown and Med Center. This home is filled with light and has a large amount of windows. 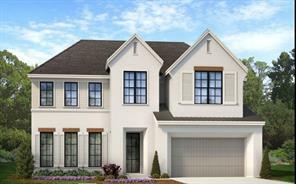 The downstairs includes a grand Entryway, Study with built-in bookshelves, large Family Room with fireplace, custom lighting, built ins and French Doors leading to lush landscaped back yard. Hardwoods throughout the first floor. The Dining Room is off the Kitchen and overlooks the beautiful yard. The chef’s Kitchen includes stainless appliances, large island, granite counters, plenty of cabinetry and walk-in pantry. This home is perfect for entertaining family and friends. Upstairs on the second floor is a huge Master Suite with Sitting Area. 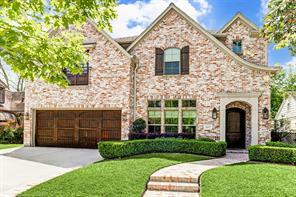 The Master has a large balcony, fireplace, custom built-ins and luxurious master bathroom with two walk-in closets, granite counters, whirlpool tub and separate shower. There are three additional bedrooms with two baths. The third floor could be large Game Room or fifth bedroom plus half bath. Sophisticated Georgian exterior with delightfully redesigned interior for today’s lifestyle, located on one of Southgate’s coveted streets, only a block from Roberts school, 3 blocks from restaurants and bars in Rice Village; fresh contemporary colors and refined surfaces suitable for modern or traditional décor. Incredible master retreat with sitting area and fireplace, spa-like executive bath and romantic screened porch. The magnificently large custom kitchen-breakfast area designed for entertaining, easy care porcelain tile floors evocative of concrete, replaced widows, wiring and plumbing. A detached guest suite overlooking walled garden completes this unique home. Beautiful brick custom home built in 1989(per HCAD) for current owner.4 bedrooms,5 baths plus 1 bedroom/1 bath guest quarters.3-car garage,double staircase;3rd floor gameroom;large butlers pantry with wine fridge;his and her master baths,great curb appeal with gracious front porch;near Rice Village. 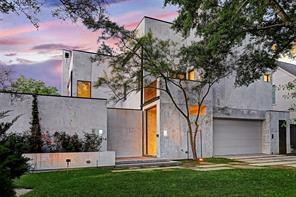 Remarkable soft contemporary in fabulous Ranch Estates, designed by Southampton Group. This custom designed and updated home features 3 bedrooms, 3 full baths, family room and 2nd floor playroom/optional study with magnificent views over the living room. An oversized balcony off the second floor overslooks the private, lush backyard. 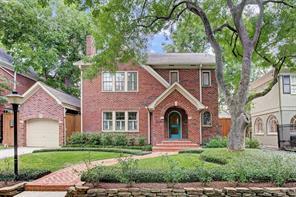 Additionally, the home features a huge front yard with mature trees and IPE enclosed courtyard. Impressive windows throughout the home bring the outdoors in while the two story living room features 20+ ft ceilings. 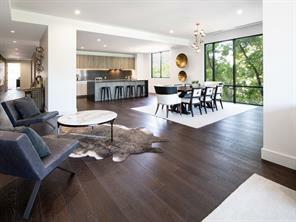 Custom built-ins, white oak hardwoods, concrete floors and designer lighting. Master retreat features a stunning Stern & Bucek bath with wood paneling surround, floating vanity with marble top, glass encased walk-in shower, soaking tub and Dornbracht fixtures. Secondary bedrooms with Jack and Jill bath and walk-in closets. Not only beautiful, the home is in a remarkable location just minutes from neighborhood parks, the Med Center and Downtown. 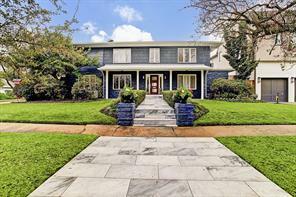 Stunning and unique updated custom-designed home in tree lined Chevy Chase. Conveniently located to The Texas Medical Center, Downtown, Greenway Plaza and Uptown Houston. This very exquisitely maintained 4 bedroom, 4 bath home with study has one bedroom with private bath, an additional full bath an additional optional bedroom or extended sitting area next to the office on the first floor. Second floor includes an over sized Master with spa-like bath a second bedroom and full bath with cozy sitting area. 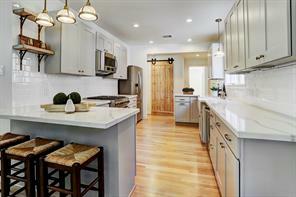 Updated kitchen with ample cabinet storage, counter space and dedicated breakfast area. Custom features throughout include glass front fireplace separating the living and optional formal dining or bar area and a 3rd floor flex room which can be used as sleeping quarters. First floor living and entertaining areas with tons of natural light and views and access to the beautifully landscaped and extremely private spa-like backyard patio and pool area with pool bath. Must see. 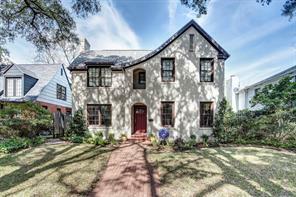 Incredible vintage charm + fabulous recent updates on wonderful Southampton corner lot with majestic trees! Per seller: 2012 updates include: chef's kitchen with new appliances and carrera counters and spa style master bath, 2015 updated 2 additional baths. Super entertaining/family living home with gracious formals with soaring ceiling and fireplace between, large family room and sunroom (or use as study) both opening to beautiful yard:pool & deck for sunning & gathering. Great flow inside and out. Huge bedrm+full bath down, lavish master suite up+3rd bed/bath up. Cute garage apartment. Garage accessed off alley. Designer touches throughout including light fixtures. Incredible natural light from multitude of windows, beautiful hardwood floors and great privacy. Few blocks to Rice Village shops/restaurants. Super Value, great square footage, renovated with large addition. Separate guesthouse. Fabulous party kitchen overlooking walled garden. 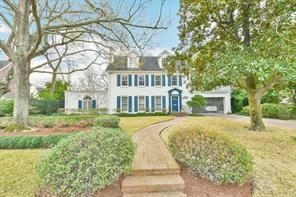 Sophisticated owner's retreat with high ceiling and quadruple molding, sitting area, spa -like bath and screened porch. Wonderful built-ins. Amazing flow. 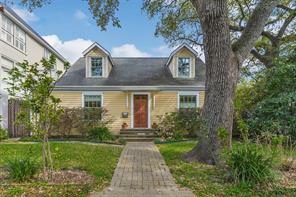 A tranquil home only blocks from the TMC and the many amenities afforded by Rice University. 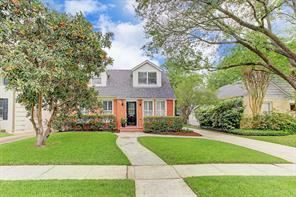 A stunning traditional home with newly remodeled kitchen & additional full upstairs bath (July, 2018). Open and bright floor plan with living/dining room area accented by a centrally located courtyard. Complete with gas fireplace and beautiful refinished hardwoods. Open kitchen design with all stainless steel appliances. Breakfast bar with spacious 13 x 16 breakfast room. Fabulous owners suite downstairs with new wall to wall carpet installed July, 2018. Large windows with courtyard views. Gameroom & 3 BRs upstairs with all new carpeting, July 2018, and 2 full baths. 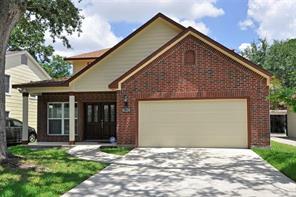 Home is located near shopping/dining, Rice University & Medical Center in the lovely Brantwood Subdivision. Redesigned and remodeled in 2018, this 4,000+ square foot ranch home has 4 large bedrooms each with gorgeous en suite baths! Open floor plan perfect for entertaining with formal dining and living rooms opening into a breakfast nook and island-kitchen. 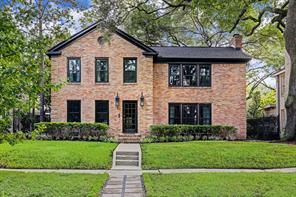 Sitting on a rare 9,000 square foot lot, walkable to Roberts Elementary, Rice University running trail and the heart of Rice Village. Beautiful owner’s suite with custom-built walk-in his and hers master closets and incredible master bath with double sinks, marble counters and lavish steam shower. Two secondary bedrooms have patio access to a grassy backyard. A large study could be used as a 5th bedroom and additional huge family/play/gameroom accesses a landscaped and fenced side-yard. 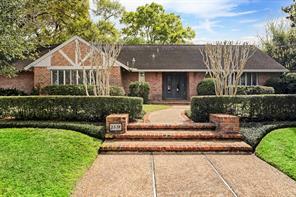 Rare ranch home in this unbeatable location is a definite must see! Featured on the Rice Design Alliance tour, this soft contemporary was created by Wittenberg Studio architects & is situated in the prime part of Southampton.Close to the med center, Rice University & the shops & restaurants of Rice Village, this home offers the mellow warmth of a well- loved family home.Amenities incl*lovely formals*cozy family rm open to cook's kitchen*2 screened-in porches overlooking lush gardens designed by McKinnon*sunny bedrooms*very unique with a flair beyond the ordinary! 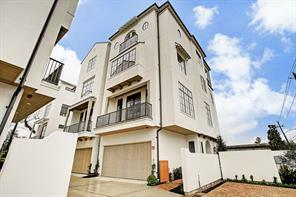 Stunning, recently completed three story townhome with first floor living. Elevator installed with access to all levels. Quality craftsmanship and attention to detail. Gorgeous natural light warms the property, beautiful curb appeal. Covered front patio, private yard, and wonderful rooftop deck. Large master bedroom with two dream closets. Third floor with large game room and den area. So many extras throughout with superior quality. 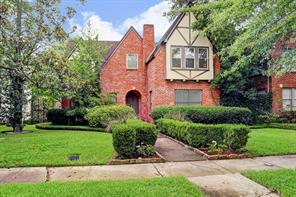 Convenient to the Medical Center, Rice University, Rice Village and Downtown. No water on property during Harvey. No HOA fees. Prestigious Warwick Towers. Luxury lifestyle on the 8th floor. 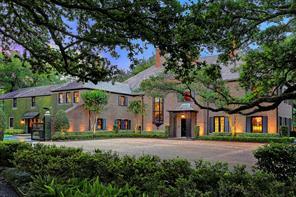 Previously owned by former Mexican President, Lic. Miguel Aleman Valdes. Four generously sized bedrooms each with ensuite baths plus powder room. The two 30 story-high twin towers connected by five bridges are locate near Houston's Renowned medical Center, Hermann Park, Museum of Natural Science, Houston Zoo, Miller Outdoor Theatre, Museum of Fine Arts and minutes from downtown Houston. Overhead lighting in living area. Three balconies. Huge living/dining. Remote operated shades on all windows. Large kitchen with ample prep area and many cabinets. Utility room is very large with more storage. Split floor plan. Second bedroom (off Master area) could be home office/study. Master has sitting area. Porter, concierge, valet, pool, tennis court, putting green, exercise facility, summer kitchen and more. three months non-refundable HOA fees and $250 transfer fee due at closing. Truly a home in the sky. Wonderful Redevelopment Opportunity! Huge potential with nice downtown views, corner lot. Building can also be saved. Large lot already subdivided, total of 13600 sqft (7 lots on 0 Chenevert, total, 8 lots) price includes survey, and all architect plans and designs. Motivated Seller! Elegant like new home with high end finishes, premium Bosch appliances and open living concept. Located on a premium street. 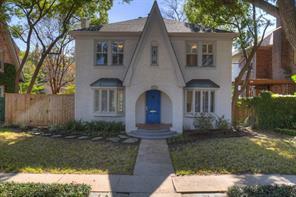 Walking distance from Rice University, Herman Park and Rice Village. Nice back yard. Master bath features spa like bath with separate jetted tub and shower, two enormous closets and a large private balcony. All bedrooms with en suite bath. Game room has full wet bar with sink and beverage cooler with extra large bedroom on the third floor with another balcony. High end finishes throughout. Elevator ready. Very energy efficient, 16 seer A/C, tankless H2o heater, etc. No HOA. 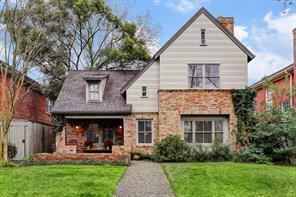 Classic 1939 Southgate brick Tudor home (2,924sf per HCAD) with 3 or 4 bedrooms and 3 full baths plus full garage apartment (378sf per HCAD)! Formal living and dining room, downstairs study with bay window and full bath, traditional kitchen with breakfast room and built-in desk area! 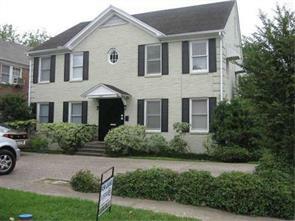 Huge extra library/sitting room/game room was added in 1987 which offers a master suite above! 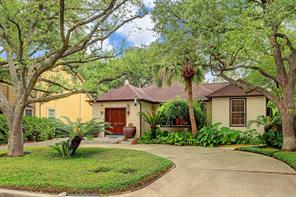 Gorgeous backyard with oversized deck and tons of greenery all on this amazing and large 8,250sf lot (HCAD). Home is gracious and livable and could be a show-stopper with a few updates! Sold As-Is, No Repairs by Seller. All Info Per Seller. 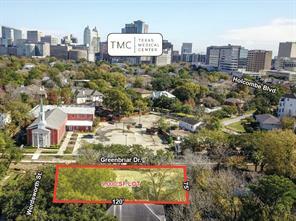 Great corner lot platted for 7 residences in the Museum District! Plenty of frontage and possibilities. 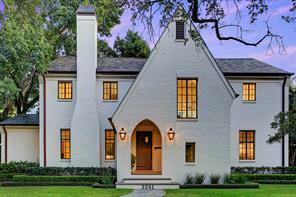 MODERN MEETS VINTAGE in this impeccably restored home. Attention to detail throughout. While maintaining vintage charm, this transformed modern farmhouse features high-quality finishes such as QUARTZ countertops, natural White Oak wood floors, seagrass carpet, designer light fixtures & white-washed cedar beam in family room. The beautifully updated kitchen features a breakfast bar, VIKING range, vintage brass light fixtures & large pantry with white-washed barn door. The DOWNSTAIRS MASTER offers a large walk-in closet & magazine-worthy master bath. This 3/4 Bedroom house has limitless flexibility for use of other rooms - large, small or multiple home offices, game room(s), studio(s) - Your choice! The large flex room / game room features a wet bar & access to a large covered balcony. Updated plumbing & electrical with LED lights & insulated windows. All information per seller. 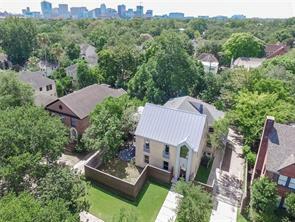 Amazing WALKABILITY to Rice Village, Rice University & TMC. Another gorgeous transformation by Altum Designs. Five bedroom home with lots of living space - 2 bedrooms down. Upstairs has a loft plus large game room with wall of French doors opening to the wrought iron lined gallery. 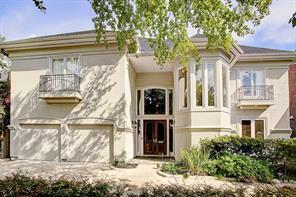 Attached suite over garage with full bath can be quarters, office, or lovely private guest retreat (528 SF). Balcony and expansive porch add New Orleans style charm. 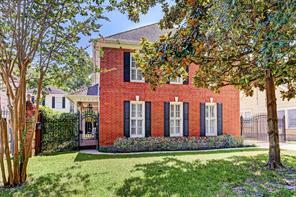 Sought after Southgate location - Walk to the Med Center, Rice University, take the MetroRail to Hermann Park and the Museum District! 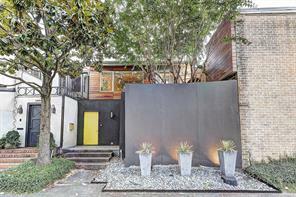 Have a look inside this charming Southgate home. Spacious four bedroom - three full baths with Master on the main floor. This home features a lovely sunroom and a generator. 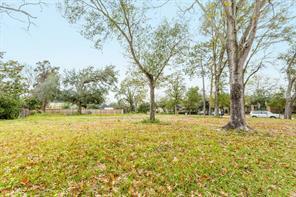 Fantastic corner lot - walkable to Rice Village, Rice University and just steps from the Texas Medical Center. 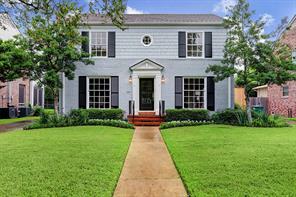 Come tour this classic Southgate home located just 2 blocks from Rice University and The Texas Medical Center. 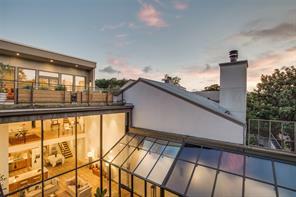 This beautiful home combines the timeless Southgate architecture along with elegant modern updates. With the location on a large corner lot and an abundance of windows, natural light overflows throughout this home. This open floorpan features large gathering rooms such as den, family room and dining room on the first floor. In addition, there is also study/home office on the first floor - perfect for those who need functional workspace without compromising other rooms of the home. Chef’s kitchen with high end JENN-AIR range, oversized refrigerator and more. Recent updates include complete repaint, LED lighting, mechanical upgrades and trim work. Did not flood during any of the recent floods or Allison. 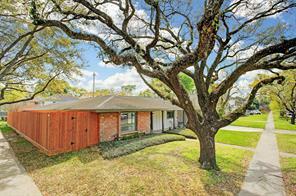 Beautiful and fully renovated home in charming Old Braeswood. Not flooded! 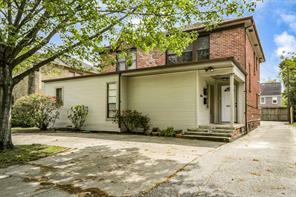 Walking distance to the Medical Center and Rice Village. Gorgeous formal living and dinning rooms, study room, large game room, and cozy family room with huge panoramic windows overlooking the beautiful backyard . All bedrooms have newly renovated bathrooms. Separate guest suite with kitchenette is on the first floor. Home sits on a large lot, perfectly oriented north/south for enjoying the winter sunshine and summer breeze through beautiful new glass windows. The upgrades of the home include: replaced all cast iron sewer pipes (2015); foundation repair with lifetime transferable warranty (2015); new AC (2015); new gas lines (2015); new roof (2018), new tank-less hot water system; replaced all carpet with hardwood floor; installed gorgeous travertine throughout family room, hallway, and breakfast room; new insulation; new covered patio; new concrete work, and much more. 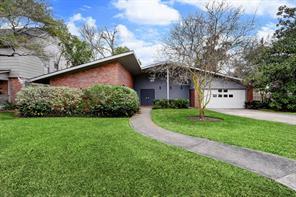 Welcome home to this beautifully and lovingly updated mid century modern home minutes to Rice University and Texas Medical Center on huge lot. One story living with open flow for entertaining and family living. 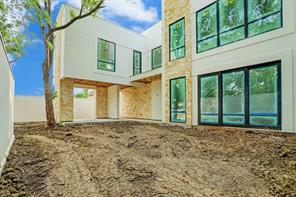 Abundant natural light from the multitude of windows view expansive front and back yards. Many recent updates include per seller: lavish master spa style bath, kitchen appliances, windows, fence/gate, landscaping, sprinkler system, hardwoods in bedrooms & office, AC/furnace/ducts, attic insulation and exterior paint. 4th bedroom has a private staircase and is upstairs. It is perfect for a nanny or guest suite or game room with a full bath. The large backyard provides wonderful outdoor living including the large covered porch and mature trees. The motorized gated driveway area is the perfect spot for a basketball game or trike/bike rides. 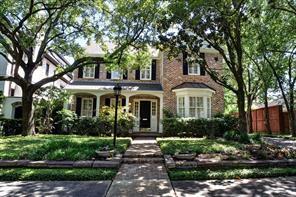 This home is a short distance to the charming neighborhood park and the shops and restaurants or Rice Village. A joy to call home! This prime duplex plus garage apt. is near the Rice Village in Southampton Ext. The garage apt. was built in 1990. There are 5 assigned parking spaces, 3 covered. Each unit has a washer, dryer, refrigerator, oven/range, and microwave. Roofs are new. Hardwood floors. Recent ac-heat replacement, painting, and maintenance. 2-2 unit on first floor(leased at $1700), 2-1 on second floor(leased at $1450), plus large 1-1 apt. over 3-car garage, vacant, market approximately $1100 (separate bedroom/and large living area and kitchen/open concept). Excellent for owner occupied investment. Near the Medical Center. 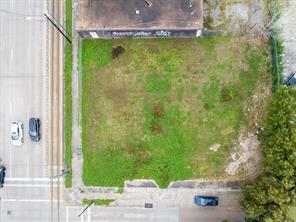 Amazing opportunity to invest or build your dream home in the Rice/Museum District! 2/2 Duplex on a large lot on a quiet street. 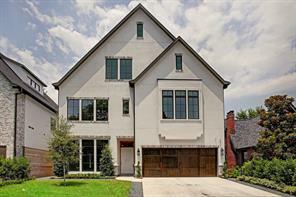 Minutes from dining and shopping venues in Rice Village. 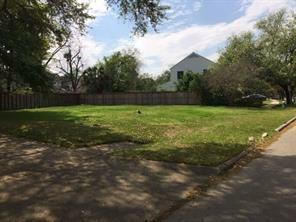 Great possibilities on this 7,440 soft lot in the heart of the city! HOME DID NOT FLOOD. Spacious and bright duplex with each unit offering 3 bedroom, 2 bath units in a split level plan. Each unit has 2 covered spaces. Living, dining room and den (could be 4th bedroom) that overlooks tree-lined lot. Access to a sparkling pool. Downstairs unit offers beautiful hardwoods in den, tile in kitchen/baths, two huge living areas, breakfast room and lots of storage. The duplex next door is still fully rented out & has same owner. Seller is open to entertaining offers for both duplexes at reasonable price. 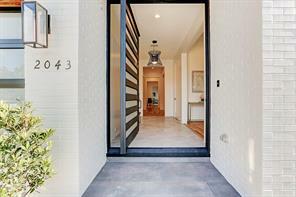 Situated in a gated enclave in the heart of the Museum District, this four bedroom masterpiece has finishes that are absolutely awe inspiring. Make your way to the second level of this elevator capable home to enjoy the living area with top-of-the-line finishes. The third floor is where you will find the majestic master suite and one of three secondary bedrooms. The top level provides the home owner with a terrace deck adjacent to a flex room that could be used as a bedroom, media room and more. 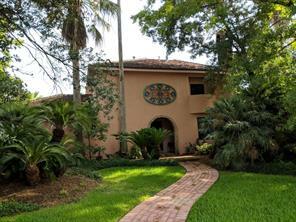 Wonderful stucco home located on a tree lined street in desirable Rice/Museum/Medical Center area! This home features an inviting entry with gleaming hardwoods floors, crown molding, elegant formals and a chef's kitchen that is a cook's delight. The island kitchen has beautiful white cabinetry, granite counters, stainless steel appliances, a pot rack and an expansive breakfast bar. The master suite has plush carpet, faux fireplace with wooden mantel, recessed lighting and is open to the private study with many built-ins. Step up to the luxurious spa-like bathroom with wood cabinetry, double vanities, separate tub and shower and a huge closet with built-ins and an abundance of hanging space. Large game room up features plush carpet and is open to a study area which leads to two secondary bathrooms that are connected by a jack and jill bathroom. The third floor is perfect for a media room and opens to a covered and uncovered area with fantastic views of the Medical Center. A must see! Spacious split-level duplex in highly desired Rice/ Museum District. Duplex has a mirrored floor plan with 3 bedrooms and 2 baths for the lower unit and upper unit. Each unit features hardwoods, large kitchen, over-sized den with built-ins that could be a fourth bedroom and two covered parking spaces per unit. Situated on an 8,400 square foot (per HCAD) lot with a large backyard and pool. This property is located on a quiet tree-lined street close to museums, restaurants and shopping. One unit is currently being leased making this property ideal for an investor or someone wanting great size lot for new construction. 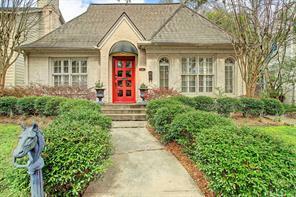 Charming and updated property with a great floorplan. Kitchen features island and stainless steel appliances, island, double ovens and opens to flexible space which could be used as a den or dining room. All bedrooms upstairs each with en suite bathrooms. Extra large living space with tons of windows, a fabulous sunroom off the kitchen area could also be used for indoor kids play area. Hardwood floors down and in bedrooms. Large, fenced backyard and wide, gated driveway keep pets and kids safe when playing outside! 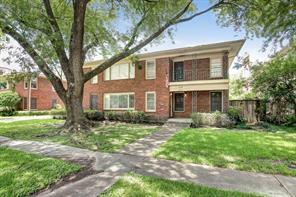 Proximity to Rice Village, Rice University, Medical Center and more! Location and Location! 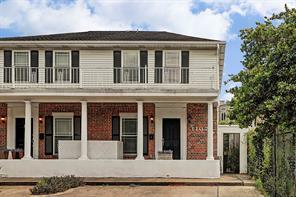 This spacious triplex just across from Rice Stadium, also with very short distance from Rice University, Medical Center, and Rice Village; also less than a mile from the Metrorail. Great investment rental property; or a great home for you in this highly desirable neighborhood, one block from Roberts Elementary. Seller prefers to sell the house in ''as is'' condition. 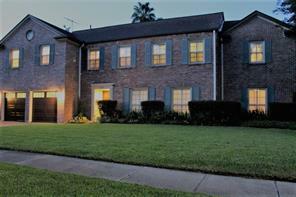 Many options for this ''rare find'' in the ''heart'' of Windermere ,addition of low maintenance landscaping,sprinkler system, upstairs recently repainted and floors refinished, separate entrance per unit. 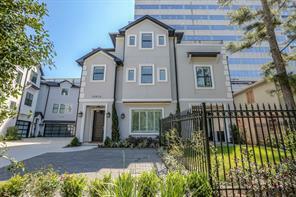 Sitting on an inviting corner lot, 5003 Chenevert is a luxury 4 Bed / 3.5 Bath energy efficient townhome with skyline views from the large rooftop terrace (jacuzzi capable). This spacious urban home has a free-flowing plan with open spaces, an abundance of natural light & huge picture windows. High-end features abound, such as a designer kitchen with quartz countertops, stainless steel appliances, hardwood floors, and soaring ceilings (13’) looking on to mature oaks. 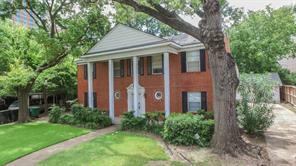 Located in the Museum Park and situated minutes to the Medical District and Downtown. 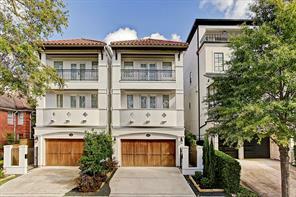 Easy access to Houston Museums, Zoo, Hermann Park, public transport and the light rail. 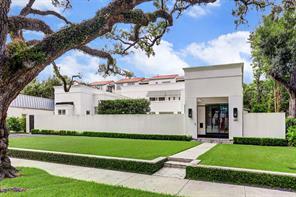 Situated in a gated enclave in the heart of the Museum District this four bedroom masterpiece has finishes that ae absolutely awe inspiring. Make your way to the second level of the elevator capable home to enjoy the living area with top-of-the-line finishes. The third floor is where you will find the majestic master suite and one of three secondary bedrooms. The top level provides the home owner with a terrace deck adjacent to a flex room that could be used as a bedroom, media room and more. Southampton traditional English Tudor with hardwood floors, crown molding, large living room, cozy den, dining room with art lighting and upstairs study. Kitchen with stainless appliances Updated bathroom with carrera marble. Sparkling pool and outdoor sitting area, sprinklers front and back. Plans available for addition! 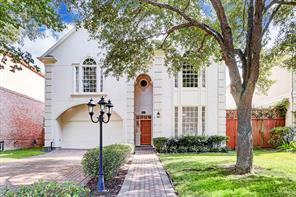 Great location, walk to upscale restaurants, shops in the Village and Rice University. 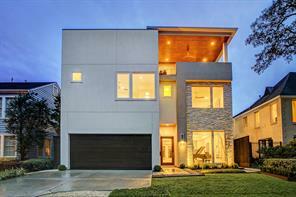 Stunning newly constructed contemporary home with views for miles. Located in the ever popular Museum District just 3 blocks from the Children's Museum and 5 from Herman Park & Gardens/Miller Outdoor Theater. 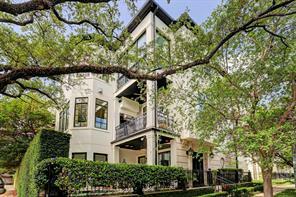 This private 4 story home is a work of art utilizing modern European fixtures and luxurious finishes at every turn. The 1st floor features a large foyer, access to oversized garage and a large bedroom/office with on suite bath and access to private deck and yard. The 2nd floor features a huge living room with walkout balcony, an impeccable kitchen with island, large dining space and half bath. The 3rd floor features another bedroom w/ full bath, laundry room and the master retreat. The master includes one walk through closet, one walk in closet and a magnificent master bath. The 4th floor features a wet bar w/ drink cooler, an entertainment space and a huge forth bedroom w/ full bath and access to fourth floor terrace. Elevator Capable. More details noted in picture descriptions. 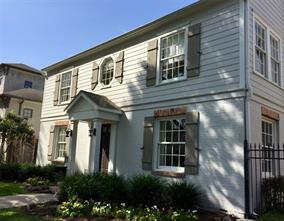 Gorgeous, nearly 4000 square foot, 3 level Southampton Townhome. Upgrades throughout (*2018 per seller). Rare first floor living area, kitchen and dining room with open floor plan and outdoor space. New stainless steel appliances and gas stove. 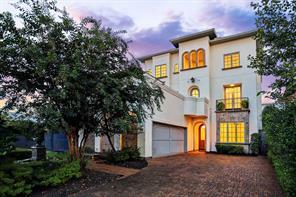 Second floor offers large master retreat with high ceilings, full balcony and two secondary bedrooms. All baths recently upgraded with quartz counter tops. Utility room on second floor with full size washer/dryer. Beautiful dark hardwood floors on first and second floors. Third floor encompasses large open space for game or media room overlooking luscious tree tops. Additional bedroom or office on third floor opens up to unbelievable covered patio and spiral staircase down to first floor. Recently installed two A/C Units and fresh paint on 1st floor. Ample storage space throughout. 2 car garage. 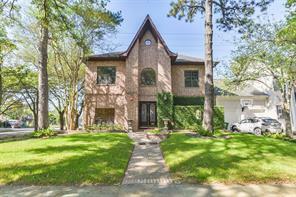 Zoned to excellent schools, walking distance to Rice University, Rice Village shopping/eateries and minutes to downtown Houston. Excellent investment opportunity. 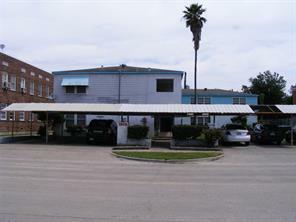 Four-Plex located near the Rice Village and Texas Medical Center. Units are 100% occupied. Unit #1 and 1B and Unit #2 are 2 bedroom /1 bath. Unit #3 is a 2 bedroom/2 bath. Live in one and rent out the others. Great location near Medical Center and Rice Village. PLEASE ALLOW 48 HOUR NOTICE TO TOUR PROPERTY. PROPERTY IS 100% OCCUPIED AND WE NEED TO TIME TO COORDINATE WITH TENANTS. THANK YOU!